Tool for checking NuGet dependencies. 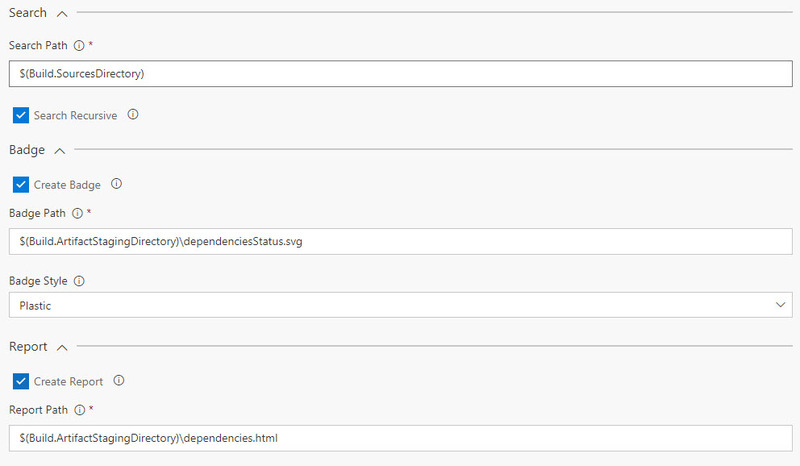 Simple Tool for checking NuGet Dependencies and publish a report as build artifact. The results will be added to a new build tab and can be saved as build artifact. (no dashboard widget yet, but i will work on it!). Feel free to submit future requests as issues! First add the root directory of the project as Searchpath. This is usually $(Build.SourcesDirectory). If you also check the Search Recursive box all packages.config files will be analyzed. Now you can say if you want to create a badge and if to create a report. The destination or the reportfile is very important. By default it will be created in the $(Build.ArtifactStagingDirectory) directory. Another build tasks has to handle this file. Ex. copy it to a webserver. Depending on your infrastructure you can also do this directly by \\yourserver\yourshare\dependencies.html. Just do the same with the badge path. Path to check for the packages.config files. Search subdirectories for the packages files. Include prerelease packages for search? Define your custom NuGet config which has additional sources. Create a badge using DotBadge. If selected, a badge will be created for every single project found. If not selected, the information of all projects will be aggregated and "the worst" will be generated. The style of the badge. Create a report of the packages. Location and name where to save report. Following open source libraries are used for this little project. Thank you for your great work!